If you were building a commercial structure on a parcel in Boston, and the local development review committee demanded that you pay your construction workers the “prevailing wage,” you’d probably be taken aback. Our state’s “prevailing wage” law applies to construction projects using public money. It does not apply to privately funded construction. You’d be even more surprised, were that same development review committee to demand that the business to be housed in said commercial building employ only union workers. For this demand there’s no legal justification even by analogy. A union is something workers must gain on their own, by organizing, according to rules carefully set forth in laws both State and Federal. No one has any legal power to just force a union upon a business. Yet that is precosely what the Boston Globe reports that two Boston City Councillors are demanding of the hotel that will occupy the building proposed or “Parcel 9,” a vacant strip of city-owned land on the in-town side of Melnea Cass Boulevard. The Globe reports that the hotel partnership will scrap the project entirely rather than accede to this demand. i can’t blame them. Killing the hotel would be a shame; even more shameful, as reported by the Globe, is that the demanders are quite Ok with killing it. There’s plenty of other developers who will agree to it, they claim. Do they really think that ? The issue should be jobs, period. The hotel promises lots of them. Of course Roxbury benefits from more and better jobs. It is right and fair that developers investing in Roxbury provide good paychecks to workers, and that most of those workers be local folk wherever feasible. But to so impose upon developers, as a condition of neighborhood approval, is to risk losing jobs; and to require that businesses seeking to locate in Roxbury unionize is a deal-breaker. And should be. No community approval committee has the right to tell a business how to conduct its affairs or to impose operating procedures. If this sort of thing is where community approval events are now at, it’s time to reconstruct the entire concept. Community approval committees were first established in response to urban renewal dictatorships of the 1940s and 1950s which savaged and even wiped out entire residential neighborhoods without even a by-your-leave. This had to stop, and it did. But today, the rernedy that saved neighborhoods 60 years ago no longer works. Community approval meetings become manipulation by narrow-based advocacy cliques, often with a NIMBY or no-change agenda. Add in local elected officials who play to the crowd, and you’ve got a Madame DeFarge mob, a dictatorship every bit as lethal as the urban renewal. Caesars of the 1950s. 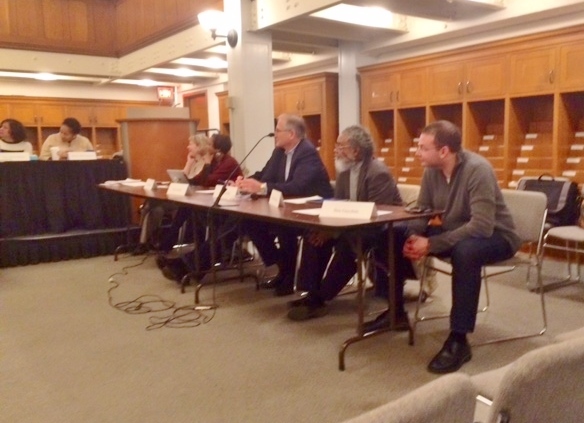 I’ve attended many Madison Park Development Oversight Committee meetings. i have seen the NIMBYers and the no-change agitators. I’ve heard the wage demands. I’ve listened to those who object to the radical population change going on all through Roxbury. One rule almost always applies to meetings of this sort : those who oppose always show up, those who support mostly do not. And of course those who don’t care one way or the other aren’t heard at all. The opposition seems enormous when its 20 to 30 people domineer a smallish crowd. The same thing is going on at the “community conversations” being held by the Boston 2024 Olympics Committee. Even though those who actively oppose bringing the Olympics to Boston are outnumbered ten to one on the ground, they show up in sufficient numbers — often the same people — at every meeting I’ve attended (so far) to make the Games look, to those who only read about in the media, like a fool’s wisp. If Boston government does not take back its decision power, and do so decisively, it risks having big planning — traffic, housing, businesses, transportation — ground to bits by nay-sayers, extortioners, and personal agendas that should never become anything bigger than personal. And it’s all so futile. Boston is changing rapidly and enormously. The marketplace is changing it and cannot be stopped. After all the noise and grandstanding have ended, Boston — and Roxbury — will get to where they are going. 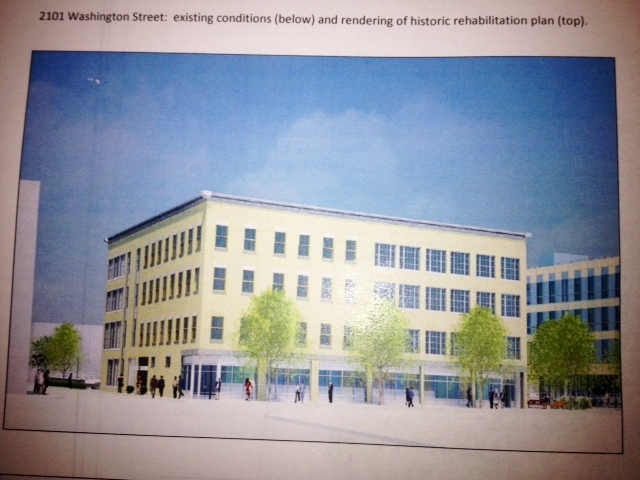 WILL ROXBURY BE THE NEW GOVERNMENT CENTER ? No one is saying so, and perhaps no one has yet decided so, but from where I sit, writing this column, it looks as though there’s a plan afoot to make what used to be known as “Lower Roxbury” the new Government Center. That, to me, is the meaning of Governor Patrick’s plan to move the Department of Transportation (DOT) from its vast building in Park Square to a large parcel of land fronting on Tremont Street hard by Roxbury Crossing. The incoming Governor, Charlie Baker, is putting that plan on hold. He said as much to Boston media yesterday. Will he also put on hold the DOT’s plan to put its Park Square megaplex up for sale ? He did not say. Delaying that sale would seem integral to delaying any move by the DOT to upper Tremont Street. in any case, the creation of a new Governemnt Center in the area centered on Roxbury Crossing — Tremont Street at Columbus Avenue across from Malcolm X Boulevard — seems already in place. Boston Police has its headquarters there. A large new office and residence project is under way on Madison Park’s “Parcel Nine.” The Boston School Department is moving into the Ferdinand Building (now the “Bruce Bolling Building”) right away. Northeastern University has buildings adjacent– large ones in keeping with the area’s new size. From a purely functional point of view, it makes sense to situate Boston’s Government Center along that part of tremot street, Malcolm X Boulevard, Ruggles street, and Melnea Cass Boulevard. It’s Boston’s geographic center. Access from it to Route 93 is near and quick. There is space for plenty of parking. Car access is not next to impossible, as for Government Center’s current locus. Relocating Government Center also makes economic sense. 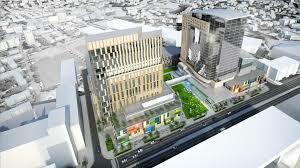 Its present site has enormous land value. Mayor Walsh in his 2013 campaign proposed selling City Hall and moving it to the Waterfront. Lower Roxbury was once densely settled with residents. It had a legendary political history. James Michael Curley and “Diamond Jim” Timilty (after whom the region’s Timilty School is named) traded campaign insults 100 years ago on its Cabot Street sidewalks. But that was then. Today the region’s sole residential quarter is Madison Park, along shawmut Avenue between Cass and Malcolm X Boulevards. that, plus what remains of the forner Whittier Street projectrs, soon to be subsumed within the megaplex planned for “Parcel Nine” hard by the spacious Tropical Foods supermarket now nearing completion. Governor Patrick argues that moving DOT’s 2400 workers into lower Roxbury would enormously catapult business growth locally : boutiques, restaurants, all manner of personal service , from beauty parlors to movie houses and internet cafes. He is surely ciorrect. Equally there’d be a bullish impact on home prices in Roxbury — already a windfall windfall to lucky long-term owners. Moving the DOT onto upper Tremont Street would surely boost home prices even higher. 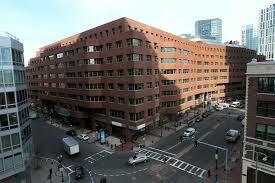 If the DOT really does relocate to Tremont Street, will not the rest of Government Center almost ineviatbly follow ? And if it does, can Roxbury possibly not be transformed, a kind of second downtown packed with high-end condominiums, expensive town houses, and an almost entirely new population ? Surely the remaking of Roxbiury, already astir, puts the area’s fifty years as the heart of Black Boston on end-game. Roxbury’s Black-Boston phase has been sliding for several decades. The end of housing segregation in the 1970s allowed well-off people of color to depart “Sugar Hill” (upper Humboldt Avenue, Elm Hill) for Newton, Milton, Canton, Needham; most did so. The transformation of the South End into a million-dollar zip code pushed less well-off denizens across Cass Boulevard into Roxbury proper ; today that move has already visibly changed its racial makeup ; it continues. Meanwhile, long-term residents, their homes suddenly worth lottery ticket money, are cashing in and moving to wherever ; and this turnover continues too. 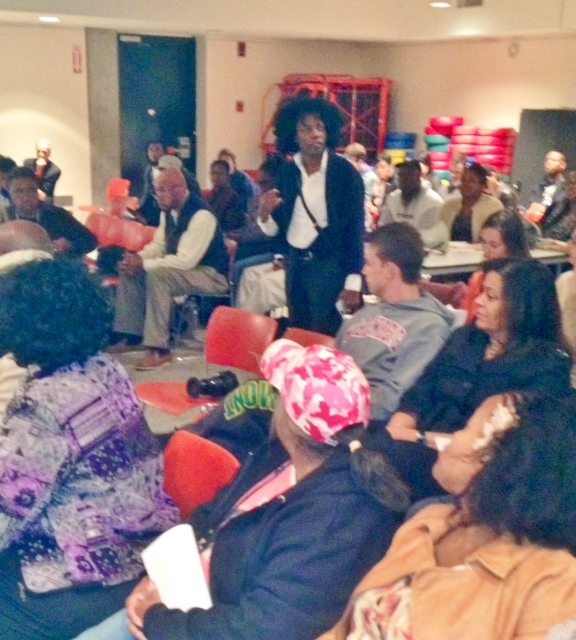 It is this tide that has current Roxbury residents so concerned about the DOT’s plans. For not everyone is moving out or moving in. Those who live in Roxbury and want to continue living in the kind of Roxbury they feel comfortable living in (and that comfort involves, for some, that the area remain majority Black) realize that change happens; but they are not eager to speed it up. Thus the unease being ruited now about the “Parcel 3” DOT plan. Yet Roxbury has never been a neighborhood of stability. Its central locus has always assured — from the very beginning, in 1630 — that it would be a pass-through, not a destination; and a pass-through it has always been. 100 years ago, it was German and Latvian; then it became irish, Jewish, and italian; then Black and Cape Verdean; and now it is becoming new-Boston. Those who live in Roxbury live in a kind of bus station — Dudley Station writ large — through which dozens of buses are constantly arriving and departing. Not that the fact makes living it any easier. There are many corners of Roxbury in which one wishes stability could prevailIs hard not to love Fort Hill as is, the Victorian mansions, brick townhouses, curvy narrow streets, steep slopes, and legendary Fort Hill tower ; difficult to see Saint James Street, a similar hilltop refuge of quiet, becoming something else; easy not to want turnover in the beautiful brick townhouses along Woodward Avenue, Brook Avenue, and West Cottage Street; and pleasant to preserve, as they are, the 125-year-old mansions of Winthrop, Montrose, and Moreland Streets. These corners of Roxbury, and many others, may well maintain something of what they are today. but who occupies them will change big-time. Given the enormous changes happening in Center City — think 50,000, maybe more, new, well-off residents stacked in high-rises all through Downtown, the Wateront, and the Seaport — there is no way that Roxbury, which abuts the leading edge of this tsunami of transformation, can fend off the flood. I think every Roxbury person knows this. So the neighborhood is asking to be invited into the process; to state its concerns; to propose emendations; and to be, in some way, part of the change rather than its discards. Three outgunned Boston City officials had little choice but to listen — quite sheepish, maybe a bit stunned — as easily 150 very vocal Roxbury residents made it angrily clear they were having none of what the City was proposing: that the former Radius Hospital, now closed, be used as the replacement for the now shut down Long Island shelter and detox. 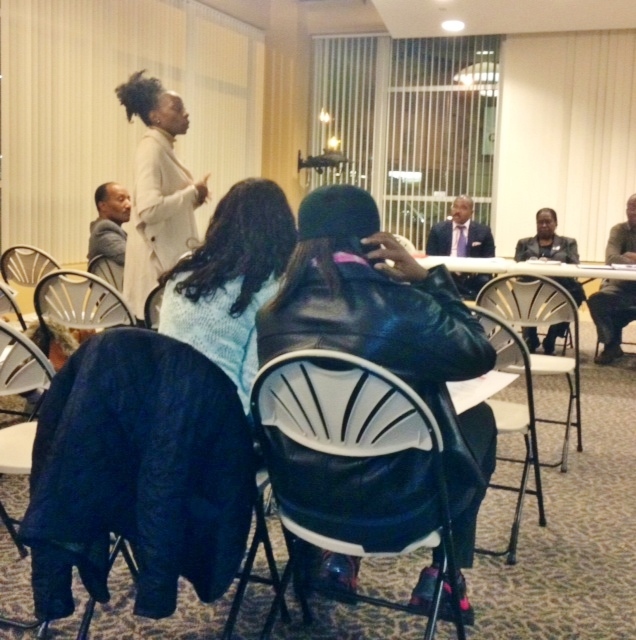 The timing of last night’s “Community Meeting” at the William Munroe Trotter School on Humboldt Avenue could not have been worse for a proposal controversial in the best of times. In light of events at Ferguson, Missouri and the choke-hold killing of Eric Garner in New York City, many people of color aren’t really trustful of bureaucrats from downtown or their proposals. 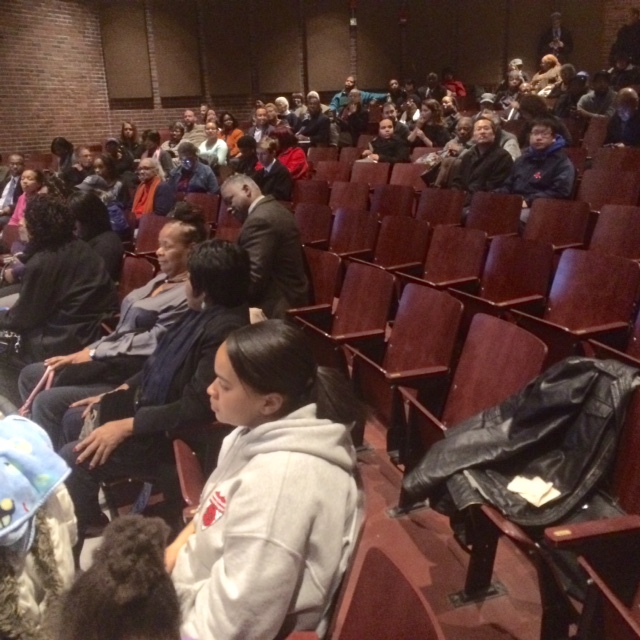 Almost everyone in the Trotter auditorium had anger going on; most of the speakers voiced it. No, the voices said, we are not going for it, we are NOT having 250 to 500 homeless people sheltered permanently in our neighborhood ! Disingenuousnesss was already compromisedm however, because word had gotten arounbd (a lot of it thanks to neighborhood activist Jed Hresko, who posted on facebook a photo of City officials visiting the Radius Hospital the very morning after last week’s South End meeting, at which homeless people evicted from Long Island shelter without notice made desperate appeals to the same City officials seen in Hresko’s photograph. Thus many in the Townsend Street area already knew. They were NOT happy. 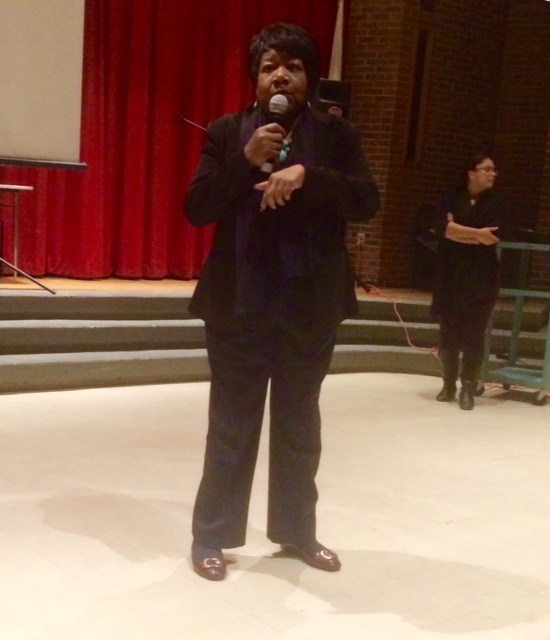 State Representative Gloria Fox, as broad-shouldered a presence as Roxbury has, made her anger felt as well as heard. So did at least two dozen residents. 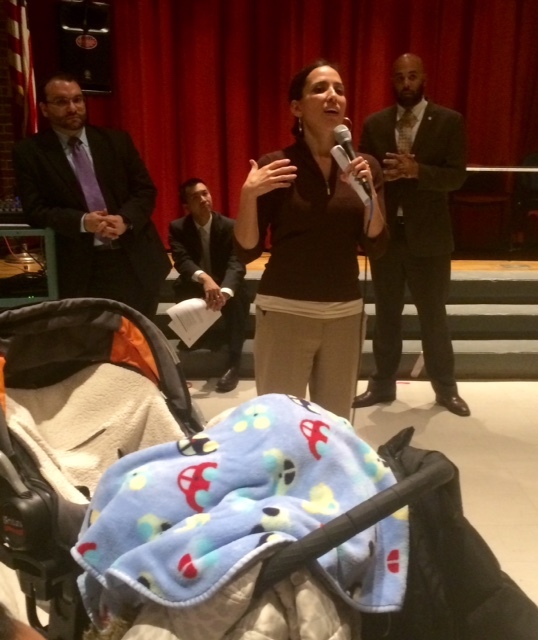 State senator Sonia Chang-Diaz tried to assure the meeting attendees at the “process’ was “just beginning” ; the residents didn’t want it even to begin. “we’re DONE with that,” said one well-spoken opponent. 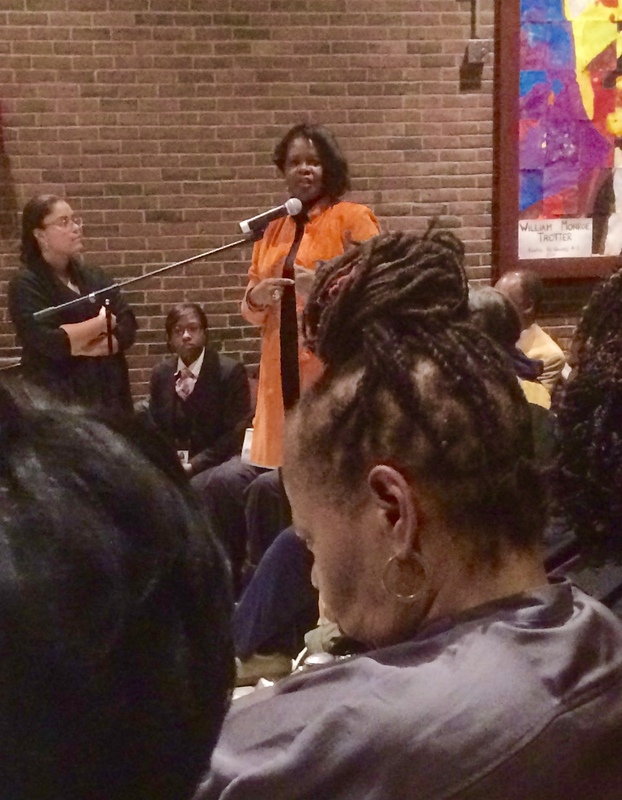 Also in the room were Councillors Tito Jackson and Ayanna Pressley — Jackson spoke last, and made a sensible counter-proposal, that radius be developed as residences; Pressley did not speak — and so was former state senator Dianne Wilkerson, whose vocal presence may well mark her return to local politics. Certainly the residents present cheered her being there and applauded her soft-spoken words. Many points were driven home, again and again : that Roxbury is a neighborhood just beginning on its way up, and to impact its upward momentum with hundreds of homeless people, many of them active addicts, makes no sense; that putting so many active addicts on streets in which children pass and repass to and from school puts the children at risk; that it is a terrible imposition for resident to have to confront active addicts and open liquor on their street as they come home from work. This being Roxbury, and people of color well underastanding the plight of society’s outcasts, many speakers made clear that they solidly support the City establishing a permanent shwlter for homeless people and strong addiction treatment protocols for them as well. Just not on Townsend Street, for the reasons given. Indeed they had. it was decided that a task force should be created, to plan a permanent homeless shelter and addiction treatment center, to replace that on Long Island, a program to serve all of Boston and to be located somewhere ; just not in Roxbury. Last night I attended a meeting of the so-called “Neighborhood Innovation District Committee,” a group of about 15 well-knowns who have been tasked with etablishing an “Innovation District,” as we now call technology research parks, in Roxbury. Unhappily, the meeting made the creation of such a district harder to achieve, not easier. Dear Ed Glaeser : what an innovation district needs is a profit. Sorry, Sir, but that is precisely how you create it. Having determined that the innovation district they were working on would, basically, do the same job that Boston’s Main Streets and Neighborhood development programs are already doing — and thereby unnecessarily duplicating said programs — the committee proceeded to discuss, for more than an hour, the kinds of “neighborhood impacts” that one usually hears at neighborhood approval meetings for residential and mixed-use real estate development : Madison Park being a good example. There was, therefore, much talk about assuring that the Innovation district wouldn’t displace existing Roxbury residents, that it would help provide employment for neighborhood residents, that it would favor neighborhood innovators, etc. In all of this well-meaning, sensitivity-trained committee-ese, I heard not one full sentence of what the building of an innovation district is all about. Considering that the committee includes very connected Boston activists — Mel King, Byron ushing, Sheila Dillon, Greg Bialecki, Dan Isenberg, and Marianna White-Hammond, Chris Jones, and Valerie Roberson, as well as Glaeser — and is chaired by former mayor candidate John Barros, this failure to address the real issue annoyed me greatly. 1. An innovation district is, in fact, a technology start-up and research park. no more, no less. 2. to create one, you need ( a ) an easy access highway or public transpo or both ( b ) space that can be rented cheaply and built just as cheaply ( c ) innovators and researchers and ( d ) investor capital. 4.putting an innovation district in Roxbury is easy to do. Melnea cass Boulevard skirts Roxbury’s northeast border and connects immediately to Route 93. The area along Cass Boulevard is well stocked with under-used warehouses, trash-mashed empty lots, and old factories. Innovators live and innovate (in lots and garages) hard by the Boulevard and all along Fort Point Channel directly next door. 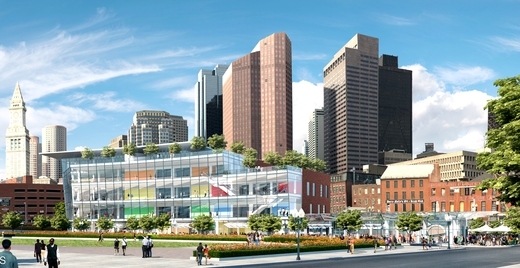 5.An innovation district in Roxbury will accelerate major change already taking place in the neighborhood, as young people unable to afford the current South End move to Roxbury next door and as the Dudley Square business district is money-jolted by the soon presence, in the Ferdinand Building, of 500 Boston school department central office employees. Real estate prices are moving sharply upward all over Roxbury, and long-time residents, who have never had much economic boon (a lot of that due to racism) now find themselves holding a lottery ticket in the form of homes worth $ 800,000 to 4 1,500,000 — usually with no mortgage to pay off, as it was often difficult to get lenders to grant mortgages in Boston’s community of color. Those who want to stay in Roxbury will need to move fast to keep up, and a lot of that keeping up will require Boston Public schools to do better, much better, at educating kids for actual jobs. The need is already there, and very pressing, but it’s easy right now to put off the difficult decisions — especially those involving the school system — for another day. Placing an innovation District in Roxbury — and thereby importing the innovators, although many innovators (yes, people of color too, believe it or not) now live in Roxbury, though you wouldn’t think so to hear what was said last night — will accelerate these changes and force everyone to rethink his or her personal situation : can i stay ? if so, how and where ? What will i have to do differently ? Is it worth it ? 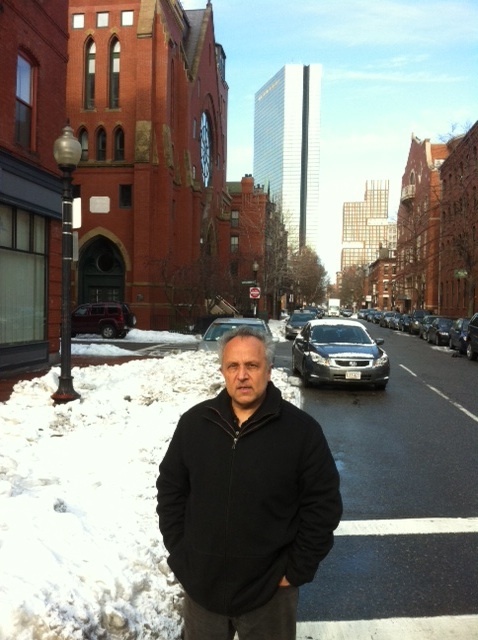 Change is difficult, but in a dynamic economy such as Boston’s, you either accelerate the change or it accelerates you. An innovation district, properly focused and not trying to solve all the ills of our society, has the economic power to change a neighborhood enormously. i would have thought that last night’s committee meeting would have understood this. It did not. Instead, it pretty much guaranteed that there won’t be an innovation district in Roxbury any time soon. Demolition of the Dearborn Middle School in Roxbury is the litmus test for the tale of two cities (“Preserve busing-era landmark,” Editorials, November 4). Preservation isn’t just about buildings and spaces. It’s about the people that bring those buildings and spaces to life ! I started high school when busing in Boston began. The tale of two cities and two school systems was clearly evident and ugly ! Fast forward to today, and the most recent school assignment plan and lack of addressing school quality are sober reminders that our busing wounds have yet to heal. Demolishing the Dearborn building affirms that we’d rather forget than atone for a segregated and unequal school system that is worse off now than when busing was ordered in the 70s. Neighborhood pride from all walks of life in the Highland Park/Fort Hill section of Roxbury and beyond celebrate the recent restoration of the Fort Hill Tower, whose history is steeped in the Revolutionary War. If we are one city, why isn’t the struggle for educational parity equally as important as the struggle for independence? Your gratitude is much appreciated and thank you for all your hard work on the Fort Hill Tower! It looks great! It was quite a voting journey for the Fort Hill Tower, Roxbury, and her supporters, some from as far away as Italy. Roxbury love spreads like jam. Easy and oh so good! We battled from seventh place, with just 23 votes to a very strong and challenging second place with 2765 votes. As noted, votes for the Fort Hill Tower came fast and furious on the final day. At its height, I counted between 15-20 votes in a matter of seconds! In the end, we came up short by 498 votes to LogMein’s tally of 3263 votes. But in the final weeks, no competitor could match our one day tally on the last day of 643 votes! It’s important that both of you mentioned neighborhoods and community. In all honesty, much of the enthusiasm you’ve praised me for, I derive from my Roxbury neighbors and the folks that supported us. The enthusiasm is ours, collectively. An email I sent out on the last day of voting summed up a big part of my enthusiasm. 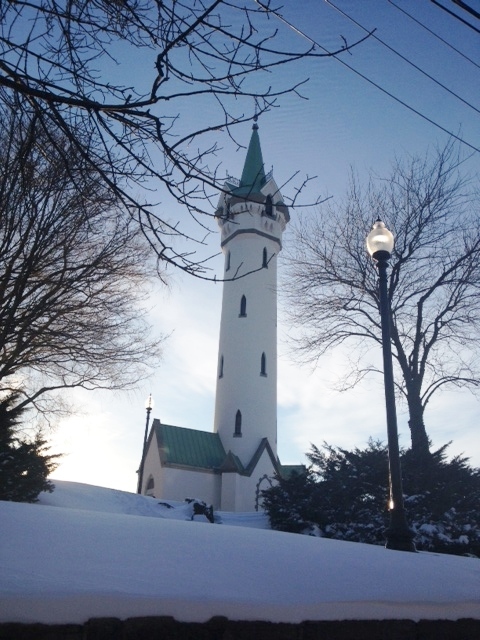 The Fort Hill Tower symbolizes our connection to one another as people in Roxbury and our connection to this time and this place. And all of that matters and is critically important to our city and beyond. My sense is that I wasn’t the only one feeling that way because folks wrote back saying yeah we do matter, and preservation means so much more — it is about people! To Mr. Mulligan’s point “the real winners are the community.” Agreed! A win-win! Our vote supports restoration work of an important city resource and is also an important vote of solidarity. Folks in Roxbury bear witness to that solidarity every day and in my mind the 643 voting fury the final day is testament to it and is just the tip of the iceberg! For that, I’m thankful! But not for a vote, rather the lesson that vote teaches. We celebrate with you the completion of projects in our neighborhood, like the B-2 police station, the Dudley Library, the Shelburne, the Bruce Bolling Administrative Building (AKA Ferdinand’s), and the Fort Hill Tower. But incumbent to the celebration for completed projects, there’s also a celebration of the folks those projects are meant to serve. Namely: are we participating in the restoration and construction with employment opportunities and business opportunities for firms of color in our neighborhood? Are we represented in a way that sustains and preserves our space in this place and time ? Or, how we can rationalize doing all of the previous projects to preserve the history, utility and capital in a building or structure and not rationalize the very same history, utility and human capital in restoring a school at Dearborn ? 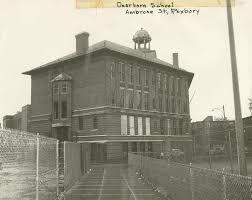 The Dearborn school building should not be torn down! God forbid! Would we do that to the Fort Hill Tower? No, we wouldn’t! The Dearborn school building should be restored and utilized as the updated, state of the art STEM facility that was promised ! Last year at Discover Roxbury’s Heart of the Hub celebration, Mel King was one of three Pudding Stone awardees. The Pudding Stone is awarded to individuals whose tireless activism in their community provokes the good in all of us. He’s right! Roxbury residents are exactly where we’re supposed to be. We’re not moving anytime soon, despite what hear. We’re here in this time and this space to show each other, the City of Boston, the state, the country and the world how preservation must work. So we invite you both to Roxbury anytime for a healthy slice of Roxbury anytime for a healthy slice of Roxbury hospitality! The future of Roxbury is not merely the matter of a neighborhood and the City we are part of. Roxbury also depends significantly on state services. 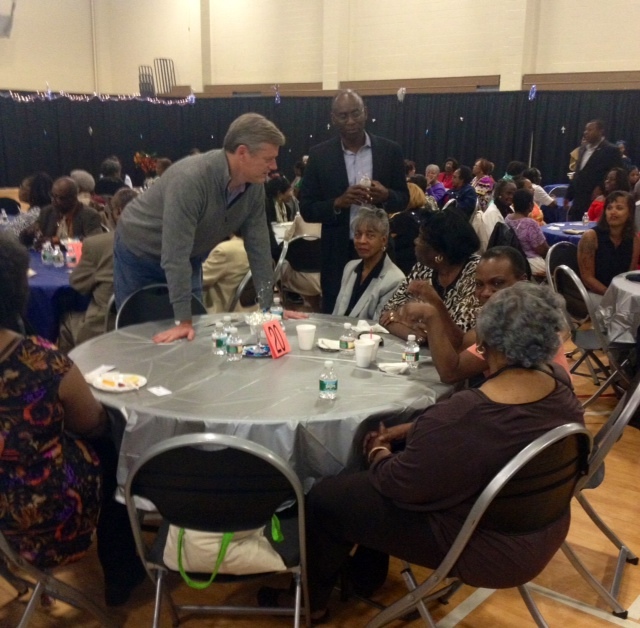 More than most communities, Roxbury relies on state agehcies fo deliver services effectively to our residents. The DCF must safeguard our children, many living in crisis. The Health Connector must work, so that our residents, few of whom are wealthy, can have effective, low-cost health insurance. Many of our residents end up in the criminal justice system; the last thing we need is a state crime lab fabricating evidence that sends our wrongly accused young people to jail. We also need housing initiatives, not all of them for affordable housing. The state owns much land in the City of Boston, and in our community, that lies unused. One candidate has proposed selling or leasing that land to developers at low cost, exploiting Mayor Walsh’ s newly streamlined permitting process, to build upon — and thus also to provide construction jobs to our people. That candidate is Charlie Baker. His opponent, Martha Coakley, has done a creditable job, as Attorney General. fighting predatory lenders; but on many fronts she has either been absent or weak. The recent 37 percent electricity rate hike, for example, was approved without, evidently, any input from her, even though the Attorney General is charged with overseeing utility rate requests. Nor has Coakley mounted much of her own campaign. Such as it is was either donated to her via endorsement by much-respected higher-ups, notably First Lady Michelle Obama and Hillary Clinton. These endorsements actually advertise weakness. A governor candidate should lend credence to other political figures, not need them to lend credence to her. But is this any surprise ? All year long, at dozens of Forums, this writer has seen from Coakley no policy commitments, few plans — and those never detailed — nor even much acquaintance with the details of key issues. Which is likely why her campaign has been run as a “vote Democrat,” generic, party thing rather than as an “I’m for Coakley” movement. Meanwhile, Baker’s entire effort exudes leadership. You have seen it as well as we have. Baker has campaigned intensely in Roxbury and surrounding communities of color, bringing a message of support for innovation, encouragement to economic opportunity, and determination to create better schools for all kids. He doesn’t just talk the talk. His support for a Roxbury innovation district walks the walk, as does his program to link local schools to the skills aspirations of local kids and the job opportunities actually available — and often begging, for lack of skilled applicants — in the area. Baker also walks the walk on drug addiction re-hab and recovery, a major crisis not only in Roxbury. He’ll designate a cabinet level position targeting recovery and mental health emergencies ; and both are much needed. Bettering the lives of our community’s people isn’t just a slogan for Baker, it’s a a passion. We can count on him to be present in Roxbury for many town halls, just like Mayor Walsh. We know this because Baker he has already done it, in the course of running the most city-intense, person to person governor campaign of any non-Democrat in decades. But most of all, Baker has made it a first priority to remedy the ineffectiveness of so many state agencies, misdoings that have wasted taxpayer money even as they disrespect we the people who count on having those services accorded to us properly and honorably. Baker is glad to be known as the “expert manager” candidate. We think he is exactly that. We are glad to endorse his candidacy for Governor. By taking this position, and this vote, the SMPOC would seem to put itself at odds with a very vocal constituency in Roxbury that advocates that held a very passionate protest outside the SMPOC’s last public meeting, only two weeks ago. The protest featured Councillor Tito Jackson, who, after speaking at the protest, succeeded at the meeting at having the SMPOC adopt rules assuring a majority of workers doing parcel 10 construction would be local residents and that all would be paid the state’s prevailing wage. 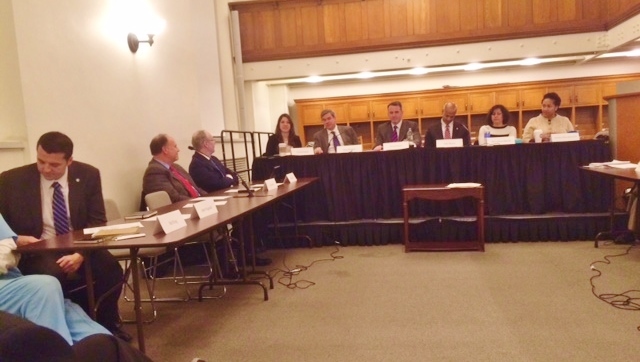 However, Jackson did not present to the meeting any motion respecting affordable housing as opposed to market-rate. as the protest’s first priority was wages and jobs, not specific housing goals, he acted accordingly at the meeting. Jackson did not attend last night’s meeting. Still, the issue is not likely to fade away. the protest loudly opposed “gentrification” in Roxbury — the buying up of Roxbury houses by people not currently living in the rea — and one questioner at last night’s meeting raised the gentriication issue directly. Many attendees followed suit : they exemplify the sentiment of many Roxburyites who see themsleves being priced out of their own neighborhood. The SMPOC took the opposite position ; that the first priority is to create market-rate residences so that people earning the higher wages that Councillor Jackson advocated for can rent living space with market-rate amenities and market-rate power. After all, the argument goes, who wants to live one’s lie always under a subsidy ? People taking this position well know that if home ownership is to expand in Roxbury, to Roxbury residents, they will have to demonstrate the ability to pay market-rate mortgage payments — and having a record of doing the equivalent by paying market rate rents. We shall see how this debate plays out. It is far from settled. 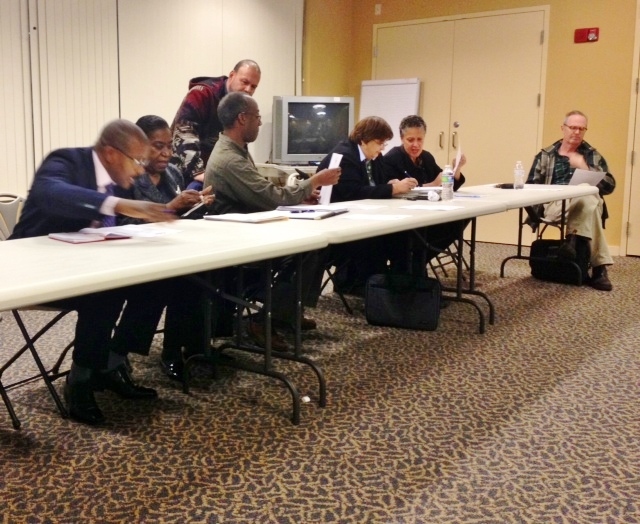 At the Dudley Branch Library last night insurgents commandeered the monthly meeting of Roxbury’s Master Plan Oversight Committee. 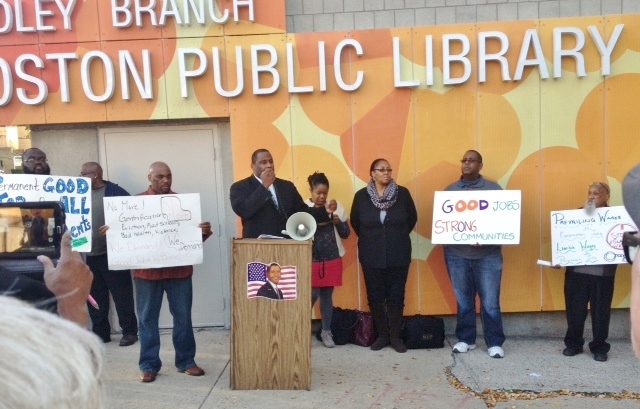 At a press conference prior, and during the meeting itself, a coalition of activists advocating good jobs, higher wages, and affordable housing demanded that their agenda be placed on the Committee’s Plan. 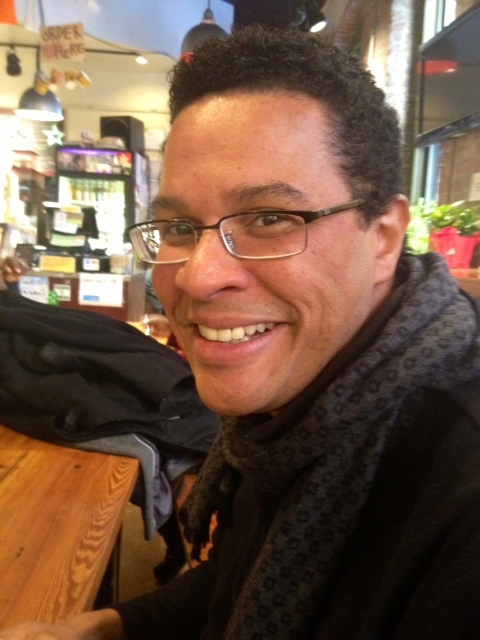 Led by District Councillor Tito Jackson, they were successful. The motion carried unanimously, to great applause and cheers from the many locals who filled the meeting room. The motion specified that 51 percent of all workers employed on new construction pursuant to the master plan be local residents and that at least 15 percent be women. It also demanded that every construction worker be paid the “prevailing wage” (as set forth by state law regarding contracts that receive state funds) whether or not they’re union members. The motion had immediate results, as one presenter, Kamran Zahedi, who plans to build a large hotel in Lower Roxbury, quickly committed to the quotas and the wage scale when questioned by committee chairman Kevin Cherry. As Councillor Jackson put it : “for too long our community has been left behind. we need to be pro active, not reactive. We need to catch up.” His mission was backed by spokespeople from a variety of workers and jobs advocacy groups. Charles Clemons, too, the voice of Touch radio as “Brother Charles,” and a successful entrepreneur, also spoke passionately in favor. Clemons has it right. How can his business prosper if his audience lacks money to spend ? Nor did Clemons balk as speakers demanded wages higher than just the new $ 11.00 an hour minimum. Jackson demanded “…at least $ 14l.00 an hour.” His figure began to look modest as some speakers spoke of a day when Roxbury workers could ask — and get — $ 50.00 an hour. Less convincing was the demand to “stop gentrification.” True it may be, a speakers noted, that Boston has the highest rate of gentrification among American cities at present. But no one had any good answer to the problem. After all, why should a Roxbury resident who has had little money his or her whole life but who now finds him or herself owning a home that’s worth $ 600,000 to $ 1,5000,000 not cash in his or her lottery ticket ? There’s also a racial tinge to the “stop gentrification” cry. The people who are buying up Roxbury homes at lottery ticket prices are mostly (not all) Caucasian and Asian. Roxbury today is perhaps the most racially diverse neighborhood in the city — but every month it becomes more Caucasian and less Black, because its houses bring huge prices that mostly Caucasians can buy. Clemons admits it. “We’ve been left behind,’ he says. “We were brought here as slaves and have been left behind ever since.’ True enough. but that doesn’t answer the question at hand : why shouldn’t the almost exclusively Black, long-time owners of Roxbury houses not cash in their lottery ticket no matter who is the buyer ? After all, are they less Black than those who want to stay and feel that they can’t afford to buy ? And it needs saying ; when stop-gentrification voices talk of “Roxbury residents,” do they mean to not include those recent, mostly Caucasian buyers who are already living in Roxbury ? If not, why not ? I tweeted this question last night . Nobody responded. Building affordable housing is a laudable goal. I am not sure how the coalition’s wage demands bolsters the goal. Raising the costs of labor — great for the laborer, and I approve — cannot lower the cost of the housing they build. Just the opposite. Clemons says that if local workers earn prevailing wage and higher they’ll then be able to buy in Roxbury. I don’t see how he gets to that conclusion. The higher the local wage, the higher the housing price will be. You can’t raise one price hugely and not bulk the other price too. To a large extent it’s a dispute between two generations. There were few senior citizens at last night’s meeting. 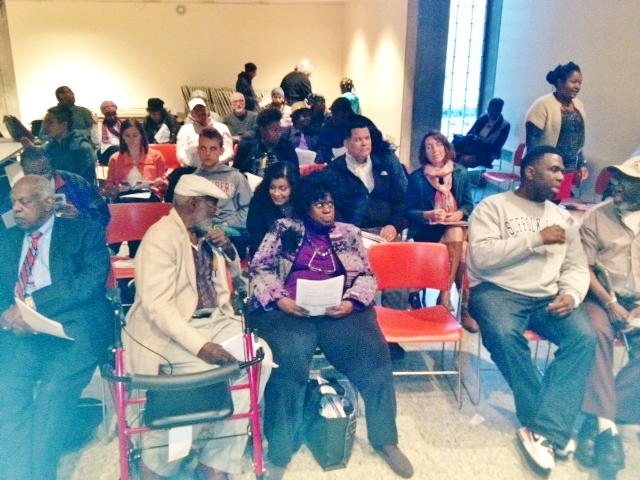 Most attendees were aged 30 to 50, the age group that seeks to buy Roxbury houses, not sell them. 7.Saturday, November 1st, at the strand Theatre 543 Columbia Road in Uphams Corber, a “Salute to veterans and COOKS, LOOKS and BOOKs, starting at 6 pm. 8.And finally, Kim janey’s “Thursdays In october’ series of events : October 9th, MassVOTE’s “Campions of democracy” ; October 16th, Disciover Roxbury;s Heart of the HUb; October 23rd, Massachusetts Advocates or Children’s 45th Anniversary Gala; October 30th, BUILDFest. Contact Kim janey on facebook for more details. More events to come, including campaign events aplenty.